Modern air sterilizers, UV lights and whole-house duct cleaning can keep your home healthier and cleaner by eliminating mold, bacteria and germs from the source and prevent them from recirculating in your air. The potential for the growth of mold and bacteria on your air conditioner’s coils is the normal result as a byproduct of the cooling process. A UV Germicidal Lamp is made to break down the DNA of mold and bacteria and will kill it at the source. 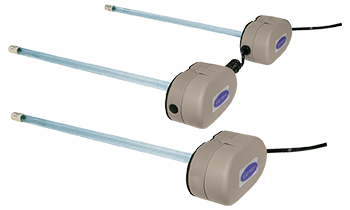 The addition of a UV Lamp to your heating or cooling system can reduce allergic reactions, illnesses, as well as eliminate odors from growth on your coils. According to the American College of Allergists, half of all illnesses (such as colds, the flu, allergies and asthma) are caused or irritated by mold, mildew, bacteria and fungi. Installing a UV light in your system will keep your family or employees healthier and your home or business cleaner. You can enjoy a home or business free of odors that bacteria and mold growth can cause. The accumulation of mold and mildew in your heating and cooling system can cause it to work longer and harder than normal. This could lead to premature failure and increased maintenance costs. A UV Germicidal Lamp will save you money on your utility bills because it will allow your home comfort system at peak efficiency for shorter periods or time.